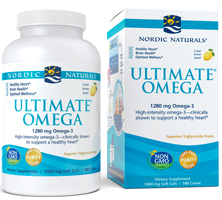 Nordic Naturals® Ultimate Omega offers 1280 mg of omega-3 per serving, surpassing the expert-recommended dose of 500 mg per day. Adequate omega-3 intake is essential to support good nutrition and overall well-being, including healthy heart and brain function, as well as mood, cognition, and immunity. High-intensity omega-3 has been clinically shown to support a healthy heart. Ingredients: (per serving) Total Omega-3s - EPA - 650 mg, DHA - 450 mg, other omega 3s - 180 mg.
Extracted from purified deep sa fish oil (from anchovies and sardines), soft gel capsule (gelatin, glycerin, water, natural lemon flavor), natural lemon flavor, d-alpha tocopherol, rosemary extract (a natural preservative). Recommended Use: Take two soft gels daily, with food, or as directed by your health care professional or pharmacist.